Back row, from left: Council member Alan Long, council member Jonathan Ingram, MVHS teacher Joel Levin, Pinya Linya team members Ethan Campbell, Nathan Paysee, Loranzo Polancho, Lillian Fitzpatrick, Kylie Scudder, council member Kelly Seyarto, Mayor Rick Gibbs, council member Randon Lane. Front row: Audrey Hannon, Camille Rogers, Brinley Bowler. 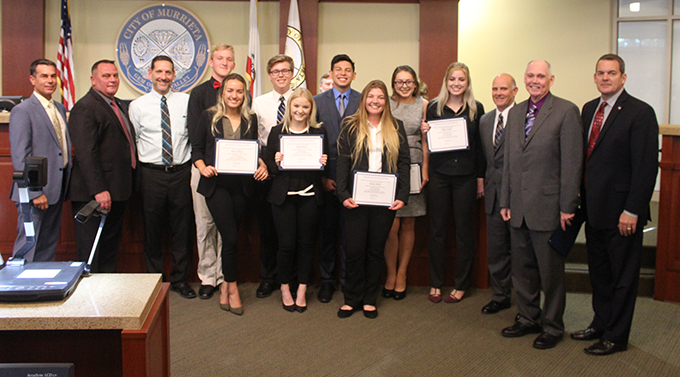 Murrieta Valley High School students who placed two teams in the top seven nationally in the Virtual Enterprises International competition were honored by the Murrieta City Council on Tuesday. The Pinya Linya team placed third and the ManGo team placed seventh out of an estimated 1,000 teams that competed in the national competition in New York in April. Teams were required to establish a simulated business, with the responsibility of running day-to-day operations in order to prepare them for a real business environment. They worked under the guidance of MVHS teacher Joel Levin and were supported by local business and city officials. In the state competition, the teams placed second and third before advancing to the nationals. The Pinya Linya team created a business that sold accessories made with a type of faux leather made from the fibers of pineapple leaves. Its virtual company website can be viewed at www.pinyalinya.weebly.com. The ManGo team created a business that sold products that produced Kinetic Energy. Its company website can be viewed at www.mangokinetics.com. 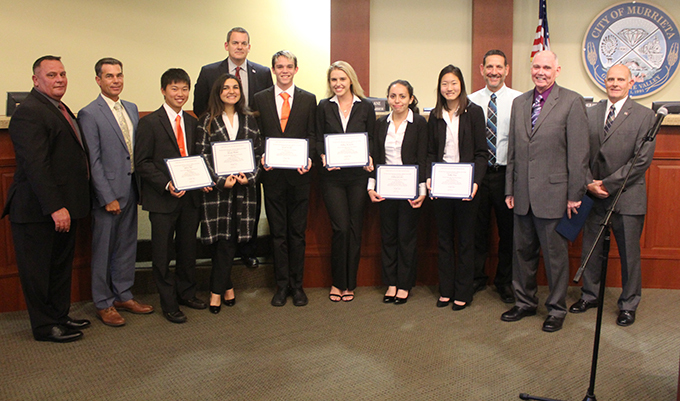 Team members were introduced and presented certificates of recognition by Murrieta Mayor Rick Gibbs. "Your poise is exceptional," Gibbs told the students. "These students were mentored to evaluate their skill sets," said council member Jonathan Ingram, who took part in the early mentoring and evaluation process of the teams. "They are all so far past the age and mental capacity of other students ... it's such a pleasure to work with them. We were not easy on them, and they performed very well." From left: Council member Jonathan Ingram, council member Alan Long, ManGo team members Jeffrey Kim, Rosana Hanna, council member Randon Lane, Jacob Frizelle, Ashley Harwood, Ashley Gonzalez, Kathy Kong, teacher Joel Levin, Mayor Rick Gibbs, council member Kelly Seyarto.